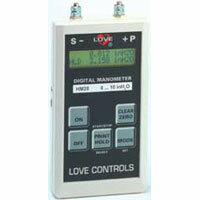 The Love Controls Series HM28 Digital Hand-Held Manometer is a precision instrument designed to measure a wide range of pressures to a very high accuracy. The unit incorporates a variety of features in an easy to use format that makes it useful in a wide variety of applications. Features include: measurement in all common pressure ranges, display resolution to 0.001, differential or relative measurement, two line liquid crystal display, and adjustable auto power off to conserve battery. We are so proud of the accuracy of the HM28 that we provide a certificate of calibration with the unit at no additional cost. Depending on your application, the HM28 can be used as a secondary calibration standard for your other pressure instrumentation. Accuracy (includes linearity, hysteresis, and repeatability): per order code. Measuring Media: Instrument AIr or Inert Gases. For HM28G3XXXXX, Any material compatible with 18/8 stainless steel. Display: 2 line, 16 character, dot matrix LCD, with switchable display sizes. Memory: 964 measured values. Recording intervals adjustable from manual, 1, 5, 10, 20, 30, seconds, 1, 2, 3, 5, 10, 30, 60 minutes. Case Dimensions: 6 x 3.27 x 1.34 in (152 x 83 x 34 MM). Error limit 0.2% F.S. for gauge, under pressure and differential pressure. Error limit 0.05% F.S. for gauge, under pressure and differential pressure.